What is it with kids and vehicles? Planes, trains and automobiles are HUGE for both genders. Perhaps it's the movement, the noise, the oftentimes bright colours. And in this case, it's the bananas-good illustration. I've always said even tiny tots can appreciate great illustration. This clever book features beautifully high-contrast board pages with one full page dedicated to a single extra-large puzzle piece. This piece can be removed from the book and replaced in the right spot, to align with the text on the opposing page, or it can be used on the floor to create one long, linked puzzle, with the other pieces from the book. 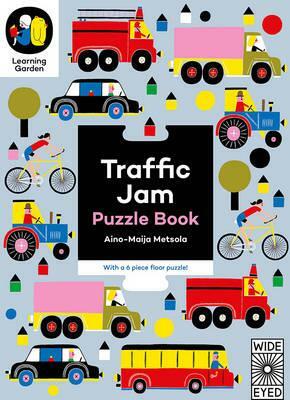 Babies will adore the high-contrast of the imagery, and older, more-mobile kids will love popping out the puzzle pieces and assembling them on the floor. Even older kids will enjoy putting the pieces in order, according to the text on each piece. For example, the truck's text says 'I'm stuck behind a bike'. A sensational colour palette adds to this gorgeous production. Lots of fun for little ones.